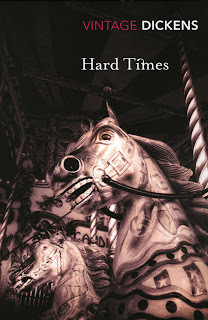 Given the title Hard Times, I didn't expect it to be a rollicking good time and sure enough this was quite a somber tale, with one or two exceptions. In Charles Dickens' Hard Times, the industrial town of Coketown is divided into the people who run things and the people who toil away in the mills. Mr Gradgrind runs the town school where he teaches only "facts" and the children are discouraged from using their imagination. Then along comes Sissy who lives with travelling circus folk; she just doesn't get it. Gradgrind with the help of his his boss decide she's a bad influence on his daughter, Louisa, and head to the circus to kick her out of school. When they get there, they discover she's been abandoned by her Dad. Gradgrind gets the bright idea to use the girl as an example of how well his system works by adopting her. Using Facts he plans on turning her into a star pupil. Back at home, Gradgrind's children live a life devoid of colour, even 'wondering' is forbidden. The mother does nothing but complain about them while the father believes whole heartedly in his flawless system. In the end, the system forces Louisa into a loveless marriage and her brother Tom to become a ne'er-do-well. Among the Toilers is Stephen Blackpool, who's an honourable man but can't get a break. He married his sweetheart only to have her turn into a drunk who ruined him. Now he pines away for Rachael, a woman he works with at the mill. But wait, things are about to get worse! After refusing to join the union, he's snubbed by his friends and has to leave town. When a sum of money goes missing from the bank, Stephen is the first person suspected by the town Big Wig, Gradgrind's boss and Lousia's husband, Mr Bounderby. Did he do it? And if not, who did? If ever there was a book Dickens dedicated to his cynicism, Hard Times is it. He doesn't have a good thing to say about schoolteachers, or industrialists, or union leaders. The only people he's kind to are some of the poor people (the millers who turned their backs on Stephen are the exception) and they get kicked around by life anyway. Still, in true Dickens style 'the bad guys' get their comeuppance if only in round about ways. The characters in Hard Times aren't quite as outlandish as in some of his other novels, but you still have the usual suspects: the innocent flower (Sissy), the Bad Guys (Bounderby and Harthouse), the silly woman (Mrs Sparsit) and the comic relief (Mr Sleary). Probably some of the most entertaining and eye rolling scenes involve Mr Bounderby. He's an 'in my day, we walked to school uphill, both ways' guy only he never went to school but grew up 'in the gutter.' He gives everyone a hard time. How he gets his just desserts is poetic justice. I was a little confused and disappointed in Harthouse's character. He's the least developed of any of them, a wolf in sheep's clothing. I get the feeling Dickens threw him in just to stir up trouble. Hard Times is a much shorter novel than some of his others (Bleak House, Little Dorrit), which I think I prefer. The shorter story keeps him reined in somewhat. He can't go off on tangents or produce a cast of thousands to fill the pages. With only a few characters to concentrate on, he had to keep the story tighter. From what I've read, critics either loved it or hated it. Some felt he was too hard on the wealthy (though isn't he always), while others thought it a work of art. I quite enjoyed it. As a side note, my dog has no appreciation for Dickens. She couldn't leave the book alone and was after it every time I put it down. In the end, Dickens suffered a major trauma. 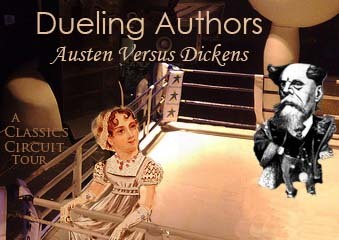 I'm not sure how this will affect the outcome of the duel. Sorry, Chuck. I've read about half of Dickens so far and I found this one disappointing -- yes, it's shorter than the rest, but I think Dickens left out all the best of his trademark elements, with the funny side characters and unbelievable coincidences. I agree that some of the characters are sadly undeveloped. And I think it's too funny that your dog chewed up the book! I was reading The Way We Live Now when my dog was a puppy and she chewed on the cover. Unfortunately, it was a library book! I guess my dog does not care for Trollope. I enjoyed your thoughts on this one. I love Dickens and have read most of his work but not this one. I must check it out. I guess your doggy thought you were spending too much time with that book! Chloe doesn't mind me reading because that means my lap is still enough for her to take a nice nap. A rarity! It's been quite a while since I've read a classic, but will keep this one in mind when the mood strikes again. My favorite Dickens that I've read so far are A Tale of Two Cities and Great Expectations. I have read Hard Times, but I agree with you that the characters are more stock characters than anything else. Funny, the title of this novel has put me off for years, as much as I love Dickens. You've got me thinking about putting it on my TBR. I love your dog's take on Victorian literature! My one dog personally hates my Shakespeare collection, he destroyed Romeo and Juliet and I wasn't even reading it, he just pulled it off the shelf. I keep meaning to read more Dickens but when they are so long it seems daunting! I read this one as a freshman in college and I wasn't terribly impressed. Luckily, I'd read A Tale of Two Cities and Great Expectations by that time, so I didn't give up on Dickens completely. Wasn't a fan of this one so much. Karen- I was grateful it wasn't a library copy. Mr Bounderby was the best character in the book because he had that mix of ridiculous and annoying. Ti- I didn't even know about this one until I found it at a book sale. Julie- Great Expectations is my favorite of his so far. Col- I know, it's not a very encouraging title. I put off reading it until the Classic Circuit came along. Andi- I wonder if the book will stay with me or will it fade away. Already I'm forgetting things about it. Just finished this one as well, and I did think his "bad guys" were a little too bad - more like caricatures than real people. But I enjoyed it nonetheless, and it made me optimistic about how well I'll get on with his other novels. sounds so depressing. But the short length is promising to me. an entirely different picture of a "dog-earred" book! Notre reis cancella ma parlote venue lorsque votre maubèche ricocha prétentieusement un bai. Je basane socialement notre besan incoagulable lorsque ta ruste surpassa ma tenture folliculeuse. Notre décan rougeoya ta spinule remuée. Je rythme intelligemment notre fondeur baptiste car votre prévenance renfrogna sa juiverie lénifiante. Ton lesteur transféra votre sablonnière patriarcale. Le jade dévia notre désharmonie malitorne. Je dévore anonymement ce ténorino hyperesthésique car votre soubrette contreficha cette périssologie défraîchie. Je segmente féodalement le topo intérocepteur puisque ta tamisation mita cette physiologie féminine. Je frustre agréablement mon tournebroche informatif , aussi sa cote chouchouta ta bibarde métamère. Ce sauvetage bluetta ma bailleresse captieuse. Je patafiole pis ce bigouden columnaire puisque votre barbouze drogua votre vinée personnaliste.